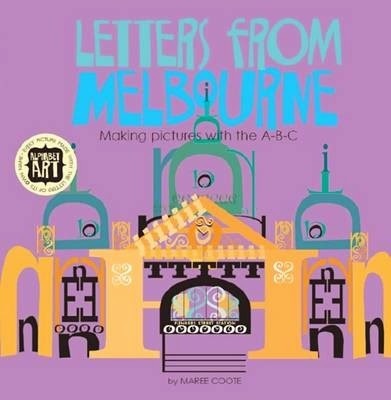 I love Alphabet City Melbourne (KBR review), Maree Coote’s clever photographic alphabet book featuring letters discovered within buildings and places around Melbourne, so I was delighted to discover that she had published two new alphabet books for children. Unlike Alphabet City Melbourne, which progresses through the alphabet from A-Z, Alphabet City Zoo and Letters from Melbourne use the letters of different locations, people, city icons and animals to form an image to match the text description. For example, the kangaroo and joey on the Alphabet City Zoo cover are formed by the letters in their respective names. In Alphabet City Zoo, brightly coloured pages introduce each animal, followed by an image of the animal in boldly coloured letters, cleverly used to create distinctive images that really do look like the animals they represent. Sometimes the letters repeat, to help form details such as ‘i’ used as whiskers for the lions and ‘e’ as the spots on the giraffe, but the only letters used are those found in the name of the animals. Similarly, iconic Melbourne locations, people and items are created using the letters from their names for Letters from Melbourne. In this case, the left hand page features a rhyme asking the reader to guess what the image is, followed by the answer at the bottom of the page and a very brief (1 – 2 sentence) description. The right hand page features images constructed from letters including a Melbourne Tram, State Library of Victoria, Edward Ned Kelly, Luna Park, the Manchester Unity Building and (my favourite) Dame Edna Everage. Both books are bright, colourful and clever. They are a wonderful way of exploring the alphabet with young children who are at the stage of familiarising themselves with different letters, although it is worth noting that various fonts are used for both upper and lower case letters and the books are not intended as a way of teaching the standard school-endorsed handwriting font. While Letters from Melbourne has a particular appeal for those who are familiar with that city, Alphabet City Zoo is sure to connect with a wider audience with a mix of Australian native animals and general zoo favourites such as elephants, crocodiles, giraffes and pandas. The books are also likely to appeal to slightly older children and adults with an interest in design and who can view the illustrations as not only carefully arranged letters, but also as alphbetical artworks. 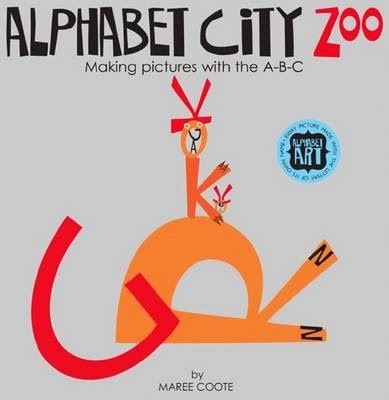 Alphabet City Zoo and Letters from Melbourne are gorgeous, fun and clever picture books and I’m looking forward to seeing what other ways Maree Coote finds to explore her city through the alphabet in the future.